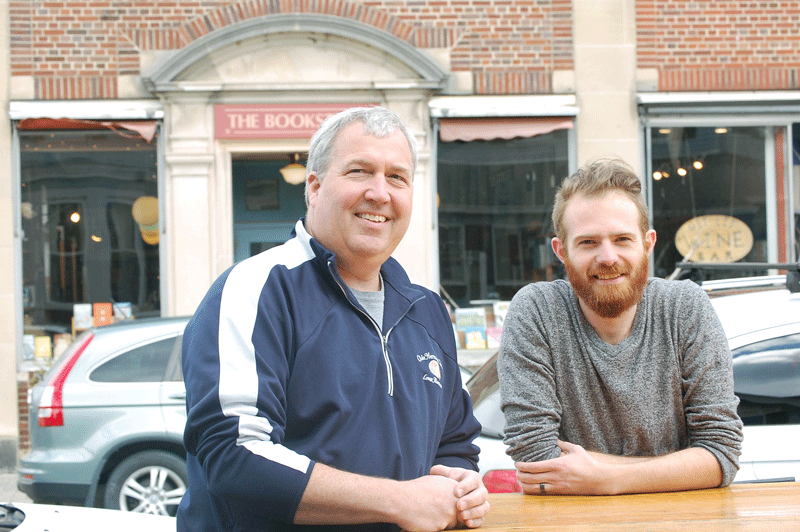 John McNinch (left), owner of the Olde Heritage Tavern, and Kameron Spaulding, director of the Lenox Chamber of Commerce, take a moment on Housatonic Street, one of the busiest centers for retail and restaurants in Lenox. Still, it’s true that all walks of Lenox life pass through its doors regularly — members of town government, residents, tourists, and the in-town workforce among them. McNinch himself is a former selectman, current town moderator, and property owner in Lenox — and with his restaurant situated smack in the middle of Lenox Village, the Berkshire County town’s walkable center, he has both a birds-eye view and an ear toward the undercurrent of what’s happening. Common topics of conversation, according to McNinch, include the overhaul of zoning laws to better accommodate new and diverse businesses. The lack of a vibrant evening and late-night scene in the village is another, and most recently, Lenox has been abuzz about an influx of new hotel developments and renovations, and concurrent discussions about tax incentives for new arrivals in the hospitality sector. Indeed, Lenox is a town that is trending older, with a median age of 51, not unlike most of Berkshire County. It’s also not a community that has the infrastructure for big-box stores or office construction for large outfits, said McNinch. But it is primed for small businesses, regional offices, and niche services. That’s not to say all of the action happens in Lenox Village. Lenox, which abuts Lee, Stockbridge, and Pittsfield, is surrounded by walking and riding trails, most notably those in Kennedy Park — a town-owned network of former carriage roads — and also has a bustling commercial sector along Pittsfield Road (Routes 7 and 20), featuring the Lenox Commons shops and restaurants, outdoor outfitter the Arcadian Shop, and Guido’s Marketplace, a specialty grocer of some acclaim in the region. Lenox includes two properties often described as ‘spa getaways’ — Cranwell Spa & Golf Resort, which also has an historic, 18-hole golf course built in 1926 and several banquet rooms — and Canyon Ranch, one of five international locations of this high-end resort that often caters to clandestine celebrities. Lenox Dale, a southerly section, represents the town’s small industrial center, and is situated on the banks of the Housatonic River. Hotels, motels, inns, and bed & breakfasts appear in nearly every section of town, including the Yankee Inn and the adjacent Hampton Inn & Suites owned by Joseph Toole, a Lenox-based developer who is currently heading up construction of a new Courtyard Marriott on the same stretch. The project will add 92 more rooms to the town and represents an $8.3 million private investment. Another Berkshire-based developer, Vijaysinh Mahida, owns the newly opened Hilton Garden Inn on South Street in Pittsfield, just over the border from Lenox, and is planning another Lenox construction project on the site of a recently razed hotel — this time an extended-stay property with an event center. Plans are also afoot near Shakespeare & Co., a popular theater venue, to construct a luxury resort named Spring Lawn on the grounds of an historic mansion. David Roche, chairman of the Lenox Board of Selectmen, agreed that building on existing strengths — in the tourism sector in particular — is the best course of action for the town in terms of maintaining its residents and business base while at the same time attracting new, younger audiences. He said town government and the Lenox Chamber of Commerce have been working more closely together than ever before to identify areas of opportunity. Roche jokingly refers to these funding sources as the “tourist tax,” underscoring how important that income is to Lenox, and also where the town and its chamber most often converge. Kameron Spaulding, newly appointed director of the Lenox Chamber of Commerce (as well as a member of the Planning Board), has a similar outlook on the future of Lenox — one that sees many opportunities for growth, starting with the already-strong tourism sector. It was ‘Reuben Day’ at the Heritage Tavern when he spoke to BusinessWest, and the dining room was packed. “It’s an exciting time — we’re expanding what we’re doing as a chamber,” he said, noting that, in the past, the Lenox chamber has functioned more as a visitor’s bureau. Now, with Spaulding at the helm along with an influx of new blood on its board of directors, attention is turning to more fiscally minded matters. Spaulding broke the tourism argument down further, calling attention to the role the restaurant and hotel sectors play. The warmer months are key for Lenox, which houses one-quarter of all of the hotel rooms in Berkshire County and also plays host to the Boston Symphony Orchestra at its ‘summer home’ at Tanglewood every year. It’s this busy season that Spaulding said the town must capitalize on, and this year marks a jumping-off point into several new endeavors bolstered by some strong numbers. Spaulding said hotel tax numbers are also up, with about 2% growth, and adding to that base to meet the county-wide demand for rooms — which typically reach 90% occupancy or higher in the summer — is one way Lenox can position itself for further development across many different sectors. To this end, the chamber is aiming to become more involved at Town Hall — almost as a lobbying entity — speaking in favor of hotel development as one way Lenox can grow and prosper incrementally. Still, not everyone is in favor of the move. Known as TIF, this public financing method is used as a subsidy for redevelopment, infrastructure, or other community-improvement projects around the world, and is not a new concept to many towns and cities. Tax incentives for new construction projects are considered by the Board of Selectmen on a case-by-case basis, and ultimately presented to voters with a recommendation from the board. McNinch echoed his support of the hotel-based tax incentives, adding that they create a direct stream — in terms of both funding and needs for services — into Lenox as new projects are wooed to the region with attractive offers. McNinch has a keen sense of the balance between the summer months and year-round business, and how a greater balance can be achieved by playing to strengths. He said he notices growing confidence among his own patrons — seeing them more often, and more comfortable with spending some of their disposable income — as well as new activity in Lenox Village, the town’s busiest retail and dining center. Spaulding added that there’s long been a misconception of many empty spaces in Lenox Village, which is largely made up of small retail businesses and restaurants situated on a small network of visible streets. The chamber itself will be moving into a new space on Main Street, which will provide better visibility, and a Great Barrington staple, Asia Barong, with its massive oriental sculptures, will soon open a new location in Lenox Village. Speaking to the level of activity during shoulder seasons, Spaulding added that the fall of 2015 was almost as good numbers-wise as the summer season, due in part to the habit among Lenox residents to ‘reverse hibernate’ during those busy warmer months. In fact, the chamber’s largest fund-raiser of the year and the town’s largest community event, the Apple Squeeze in September, marks the close of the summer season and will be expanding further this year to include an outdoor farm-to-table dinner, 25 more vendor booths (and a waiting list of more than 40), and musicians who will play the streets as well as a capstone Sunday concert. A traditional fall event in Lenox, the ‘tub parade’ hearkens back to the Gilded Age of the 1800s and the autumn carriage tours made by the wealthy to bid farewell to the region. It, too will be expanded through collaborations with other nonprofits to create a Gilded Age weekend. Meanwhile, the town’s holiday event, Making Spirits Bright, just launched last year and will repeat this year with plans to add more involvement from the town’s restaurants and retail shops. So, when people ask Spaulding — or McNinch, Roche, and their fellow Lenox leaders — what’s new, they’ll often settle into a seat at the Olde Heritage Tavern to tell tales of upcoming excitement.